As one of the most established 3D printing technologies, Binder Jetting offers a faster way to produce sand moulds, small metal parts, decorative objects and prototypes at a lower cost. But with a wide range of Binder Jetting machines on the market, it is important to choose the right printer for your 3D printing needs. We’ve compiled a list of the top 5 Binder Jetting machines, along with their pros and cons and particular applications. Note: Binder Jetting is a powder-bed technology, and works by using a print head to apply a liquid binding agent onto layers of powder, bonding the powder particles together. You can find more information on binder jetting technology in our short guide. Developed by Digital Metal, a subsidiary of Höganäs AB, the printer employs a high-precision metal binder jetting technology, allowing for greater accuracy and a higher resolution. And when it comes to producing small batches of complex metal parts, the DM P2500 printer has several advantages over traditional manufacturing methods. For example, since the machine has a (unscaled) build volume of 203 x 180 x 69 mm, it is possible to nest several parts into one build platform — without needing any support structures. The leftover powder is also almost 100% reusable, which significantly reduces waste. As the machine operates at room temperature, the cases of warping and shrinkage during the printing process are quite rare, which leads to a lower scrap rate. 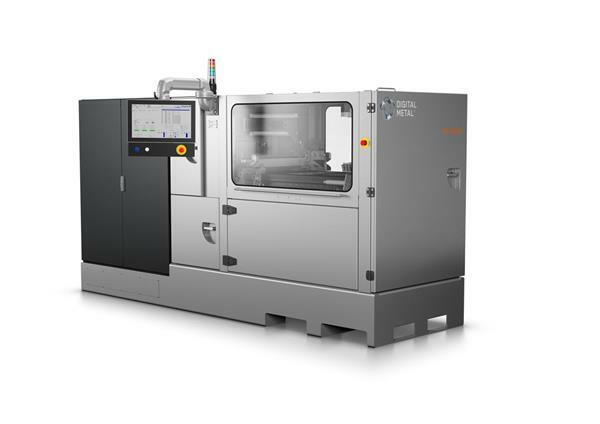 The DM P2500 supports three metal materials – stainless steel alloys and titanium – which are ideal for industrial-grade applications in medical, aerospace and automotive, as well as in the production of luxury goods and industrial equipment. One thing to consider, however, is that your metal parts will require subsequent post-processing (usually infiltration and sintering), which will need to be factored into your budget and timelines. 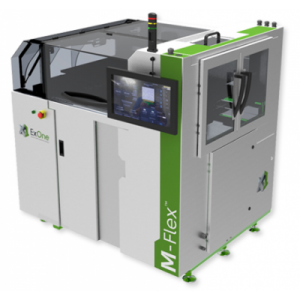 ExOne’s M-Flex 3D printer is another industrial-grade solution for metal additive manufacturing. Compared to the DM P2500 printer, the M-Flex has a larger build volume of 400 x 250 x 250 mm and offers a wider range of metal materials, such as stainless steel, bronze, tungsten, and Alloy IN 625, as well as non-metallic materials such as glass, silica and ceramic sand. 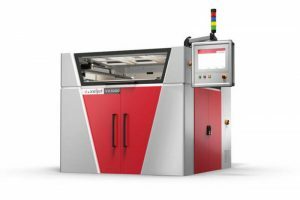 The M-Flex 3D printer is especially well-suited for the production of customised metal parts in the automotive, aerospace, heavy, gas and oil industries, and also for consumer applications. As a rule, functional parts will need to be cured in a furnace to enhance their mechanical properties. As the M-Flex is a large-format 3D printer for industrial uses, it does have a higher price point, starting from $450,000. (source) and, therefore, not a budget-friendly option for small businesses. German manufacturer Voxeljet AG is known for producing some of the largest 3D printing systems, ideal for industrial scale production. As one of voxeljet’s highest selling machines, the VX1000 3D printer has a lot to offer in terms of quality and speed. Indeed, thanks to its fast printing speed, the machine offers a faster lead time, while its high resolution (of up to 600 dpi) allows for a great level of precision. The VX1000 has a build space of 1,000 x 600 x 500 mm, which is large enough for medium-volume production. While it offers fewer materials than the M-Flex 3D printer (materials include silica sand and PMMA – a recyclable transparent thermoplastic) the VX1000 is ideal for the production of cost-efficient sand cores and moulds as well as plastic parts. The application of these parts range from functional prototypes and display models to metal casting. As with all Binder Jetting systems, parts produced with the VX1000 will require post-processing to achieve better mechanical properties. The Projet CJP 860pro is the largest among the family of ColorJet Printing systems. The printer has a comparatively large build volume of 508 x 381 x 229 mm, allows for nesting and can create parts with fine resolution. But the core advantage of the machine is its ability to 3D print in full colour. With full-colour palette, the Projet CJP 860pro is an attractive option for manufacturing products for consumer applications like concept models, prototypes, and figurines. 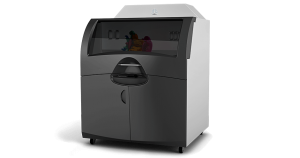 The Projet CJP 860pro uses the proprietary plastic material VisiJet PXL and also has a separate cleaning station. One key point to bear in mind is that the Projet CJP 860pro 3D printer is not suitable for functional parts. Furthermore, as the parts printed with the machine are initially rather brittle, they will need to be inflitrated to achieve greater strength, in addition to post-processing to achieve an aesthetically pleasing finish. While the machines above are aimed at industrial applications, the ComeTrue T10 is a full-colour desktop 3D printer. We’ve decided to include this machine into the list as this is one of few options that enable the production of parts in full colour using Binder Jetting technology. 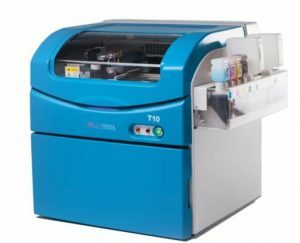 With a price point of around $30,000, the ComeTrue T10 has the build size of 200 x 160 x 150 mm and offers fast printing speeds. Applications of the machine include figurines, architectural, bio-medical and art models, and parts printed are of good quality. However, like other Binder Jetting machines, parts printed with the ComeTrue T10 will need some form of post-processing to increase their durability.